Welcome to issue 197. For the first time in several months I am writing this at the right end of the month. Hopefully you'll get this one nice and early in September. This month it is my sad duty to let you know about the passing of Richard John Artley. If you've been to any of the Discworld Conventions you would have seen Richard working tirelessly at the auction carefully organizing and recording sales. When not running the auction Richard was often seen wandering the convention halls wearing lavish costumes and with a huge smile on his face. Richard's body was discovered in his Zurich flat on the morning of the 16th August and he appears to have died from natural causes. Richard was only 49 years old. Our condolences go out to his family. We at Discworld Monthly would like to offer our congratulations to Miss Pratchett who recently got engaged. Apparently Rhianna's boyfriend proposed at their local cinema. Rhianna was somewhat confused when a film about her life started playing before the film. Louis Leigh then got down on one knee and proposed to her in front of the entire cinema audience. The Discworld Monthly facebook group now has now grown to over 5,500 members and continues to have lots of lively and fun conversations. Rachel Rowlands has stepped in and become my co-moderator for the group. Rachel organises lots of quizzes and created the Flaming Trebuchet (our virtual pub) and is about to start a virtual film club next week. 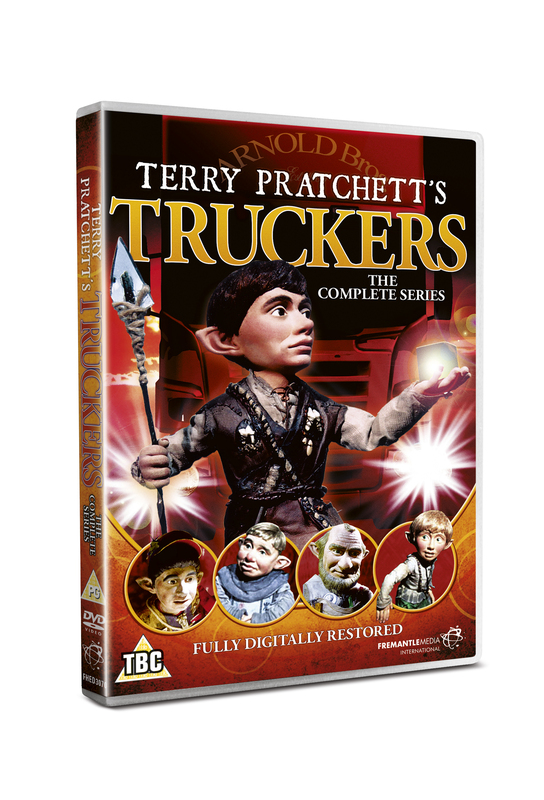 On 7th October, the first of Terry's books to be adapted for TV, Terry Pratchett's Truckers, is being released in its original broadcast format on DVD, priced 15.99 GBP. Previously only available on VHS as a cut down feature-length episode, this DVD release comprises the 13 individual episodes with the original stop-frame animation meticulously restored using the latest state-of-the-art technology. Joe McGann (currently appearing in Bertolt Brecht's The Resistible Rise of Arturo Ui), the late Sir Michael Hordern (the voice of Paddington Bear and Badger in The Wind in the Willows) and Brian Trueman (the voice of Stiletto in Dangermouse) head up the cast of voice talent with McGann taking the part of Masklin, Hordern playing The Abbot and Brian Trueman as Dorcas. Truckers will also be available to download on iTunes from 7th October, priced 99p per episode or 10.99GBP for the entire series. The Wertzone features the cover art for Terry's next Discworld novel, Raising Steam, that's due out late October / early November. The Carpet People is being released in the US for the first time this November and is going to be something quite special. The book features an exclusive story in the back - one of the original serialized tales about the Carpet People written when Terry was a seventeen-year-old journalist. The book will feature examples of Terry's black-and-white artwork and two full-colour inserts plus some never before published pieces. The first 1,000 people to pre-order the book (US only for legal reasons) will get an "art card" featuring Terry's illustrations. [I have one of the cards and it looks great - Ed]. I've not read The Carpet People for some time so look forward to revisiting it. I'll be sure to include a review next issue. Back in April we mentioned Discworld and Lego fan GlenBricker who had created a Lego version of Great A'Tuin as part of the Lego Cuusoo program. GlenBricker needs 10,000 votes to have is project looked at by Lego who will then decide if they are willing to make the kit available for others to purchase. GlenBricker recently broke the 2,000 votes mark and has now added a Rincewind character to the set. Please take a few minutes to look at GlenBricker's page and if you like the idea please vote for it. 16th Aug 2013: Very sad to hear Richard John Artley died today; collector, reader, fan, all round good guy and the personification of Sir Joshua Lavish. 17th Aug 2013: ...performed together in their entirety over, what seemed to those lucky souls in the audience, to be at least one eternity. 22nd Aug 2013: No electricity all morning... and they can legally murder you at check in if you haven't printed your own boarding pass, right? [UK] On Sunday 29th September 2013 Terry will be visiting Brighton's City Reads event along with "three friends from his multimedia company Narrativia". [Adelaide, AU] The City of Small Gods Terry Pratchett Fan Club presents "QUIZ LONG AND PROSPER" - a Science Fiction & Fantasy themed Quiz Night held Sat October 26, 7pm at Clarence Gardens Bowling Club, Winona Ave, Clarence Gardens, SA. Tickets 15 AUD Adult / 12 AUD Concession, tables of 8. Please note we have moved to San Churro from 5.30pm (San Churro, 132 James Street, Northbridge, Perth, WA). [AU] The Sydney Downunder Drummers are looking for a new venue that is a bit quieter and more suitable for effective conversation and quizzing. Our September 2nd meeting will be a pub crawl to try out potential new pubs for future meetings. On our Australian Discworld Conventions Facebook page we are asking for suggestions of places to try. Plan so far...... meet at Maloney's as usual at around 6.30pm, then head out on the pub crawl to test each one for its 'quizzing' suitability with a multi-stage quiz. For updates to our proposed route please ensure you join us on the Facebook page so you can join later if you want to. We assume any correspondence is eligible for use in the newsletter unless otherwise stated, including the sender's email address. We may edit your letters to keep them simples. On re-reading the article [about Steeleye Span] I assume you meant the new Radio 2 program was unavailable but at first I thought you meant the original Desert Island Discs program which is still available to listen online or download. Here is the link which may be of interest to your other readers. I went looking for Steeleye Span's Wintersmith album. I didn't find it (because it hadn't been released yet) but what I did find was a song called Wintersmith by German metal band Sons Of Seasons. The lyrics are true to PTerry's Wintersmith story, without actually mentioning Tiffany. I am just reading the latest issue and felt I ought to say something. I have been a fan of the band Steeleye Span since the early 1970's and thought you ought to try them out. From their Parcel of Rogues album (1973) there is one track that Polly from Monstrous Regiment would no doubt have heard: "The Ups and Downs". On the Now We are Six album (1974) there is a cameo appearance from David Bowie playing the alto sax. Another one would be "The Black Freighter" from Storm Force Ten (1977); A barmaid in "The Threepenny Opera" has a fantasy about cutting rich men down to size (Brecht). It is difficult to choose one to recommend you try as they are as prolific as the great Sir Terry Prattchett, but maybe give Ten Man Mop (1971) a try as on disk 2 you will find a track "Female Drummer" (another one that could have been written for Monstrous Regiment but is much older, older even than me). And even one for an early Commander Vimes, "Four Nights Drunk". You have inspired me to open up the vinyl album cases, dust off my record deck and dig into the delights of some early Steeleye Span. DWM replies: You inspired us to do a bit of Wiki'ing about black freighters & The Threepenny Opera, Tony. I wonder if Alan Moore borrowed the Black Freighter from Steeleye Span for the title of his comic-within-a-comic in Watchmen? Turns out one of Moore's later works, The League of Extraordinary Gentlemen: Century 1910, draws on The Threepenny Opera too - evidently we ought to get round to seeing The Threepenny Opera. I have to laugh every time I read the title Turtle Recall, as will anyone who has ever had dealings with or listened to someone from Hull talk. In their accent (where a Coke is a cerk and a nose cone is a ners cern) Turtle Recall is the way they have always pronounced the title of Arnie's 1990 film. If you don't believe me just ask someone from Hull to pronounce Total Recall for you and you will see what I mean. Long may Sir Terry reign. Thank you for all the monthly newsletters; it gives me many happies staying in touch this way. I know you've definitely told me this before in a newsletter, but could I ask you to remind me who has taken on the role of Clarecraft conservator? My sister is the proud owner of the set of 3 witches plaques, flying on their broomsticks across the dining room wall (covety covet...), but - alas - they were exposed to a lot of smoke during a small household incident and have suffered a little paint loss during our attempt to clean off the soot. I know she'd like to return them to their previous glory...who do we ask? Many thanks, and sorry to ask when you've already told me. Bless. DWM replies: There are two people that we know of that offer a repair service. Mark Ayling (discworldmonthly.co.uk/url/MAD197A) and Joe Patterson (www.fjpdesigns.co.uk/pargeting.html). Where were Ymor's headquaters located? Who was the Principal officer of the original Cable Street Particulars? What is the Rhoxie colloquially known as? Who does the Night Watch go to to have armour repaired? It's been two years since the last Wadfest. Last year Waddy and his team decided to take a break due to the Olympics. Not long after the last event it became clear that Wadfest would need to find a new home and the committee spread out to find a new location. Eventually Wood Green Animal Shelter near Cambridge was discovered. The team took one look at the new site and immediately started negotiations with the animal shelter. On Friday 9th August my eldest two daughters and I headed up the M1 towards Cambridge. After missing the sign and almost going into the wrong entrance we found our way on to the site. In true Wadfest fashion our new next door neighbour helped us pitch our tent when it looked like it was going to fly away. After finally securing the tent we wandered around the site to see where things were. This took far longer than necessary because we stopped to talk to many friends on the way. The new site doesn't have any washing facilities on site but Waddy has arranged to have some shower units on site next year. The site consists of a large field split into three sections. The middle section has a parade area that is fenced off. This area was used to host most of the events. Beyond the field is a winding path that takes you through a small wood into the animal shelter itself. The shelter has a refectory including a fully licensed bar and restaurant. The refectory was available for Wadfest's exclusive use on the Friday and Saturday nights. On Friday night a fiendish quiz had been arranged. We formed small groups and as I was sitting with some of the Discworld Monthly facebook members we called our team The Flaming Trebuchets. The quiz started with some general knowledge questions that we felt reasonably happy with. Then came the Discworld questions - as a group we managed to guess answers for maybe 5 of the questions, they were really hard. Luckily the questions moved onto other topics and the different members of our team were able to answer some more. At the end we swapped our papers with the next table for marking. Happily we were not the only team that struggled with the Discworld questions! We handed in our marked papers and the winners were announced. The top three teams were within 2 points of each other - luckily we won with 24 points (out of a possible 50!). After the quiz we headed back to the camp site where we sat around chatting and drinking until quite late. Saturday morning started slightly overcast so after breakfast we decided to find out what events were happening. The girls got involved in painting the vehicles of mass destruction - basically cardboard box vehicles that would be carried and raced by teams on Sunday once the paint had been given time to dry. During the day on Saturday a murder mystery took place. It was sometimes difficult to know who was involved in the mystery when many people took the opportunity to dress up - as the weekend's theme was After The Apocalypse there were a lot of zombies staggering around the field. Later in the parade area was the game Smack the Penguin. For the uninitiated this is a live version of a flash game that was popular 10 years ago where you have to hit a penguin as far as you can. Through folklore and tradition Smack the Penguin has grown into something of a phenomenon. Years ago Rob came up with the lines: Boo the Penguin, Hiss the Penguin, Blow Raspberries at the Penguin - people have now created T-shirts with this on. Some of the other Wadfesters had created Penguin protection banners and were heckling the game from the sidelines and others had created armbands with the Boo the Penguins wording on for the contestants. The game continued until all the "children" that wanted to had had a go at smacking the penguin. Distances were recorded and amazing Tim got through the whole game without having his kneecaps smashed by a cricket bat. After Smack the Penguin, Waddy introduced us to a new post-apocalypse game based on the idea of shooting zombies with Nerf guns. A call went out for anyone with Nerf guns to come to the parade ground and more than a few turned up. As I was gunless I decided to be a zombie. The basic idea of the game was for the surviving humans to make it across the field without getting eaten. The zombies mission was to eat the brains of the humans (by touching them on the head - no brains were harmed). If the Zombies got hit in the head they died and took no further part in the game. The humans could move 5 paces and then had to wait for 5 seconds in which time they could shoot. The zombies could only move 2 paces and then had to wait for 5 seconds. The game was a lot of fun and the humans were able to take out most of the zombies on their way to their goal. Waddy has said that the game will return to next year's event with some slight modifications to the rules. Saturday evening started at the Refectory with the reveal of the murder mystery and then came the traditional talent show. Once again the results were varied but hugely entertaining. I am sure our enjoyment had nothing to do with the mead I'd consumed before and the cider during the event. After the talent show I met up with some friends and we played a card game called Bohanza which is all about beans. Strange concept but a fun game to play. It was getting late so I decided to call it a night. It rained during the night - quite a lot. So Sunday morning was a little damp. Once the cardboard had dried out (nobody thought to store the vehicles of mass destruction undercover!) the races began. It was entertaining to watch the vehicles self destruct as the occupants pulled in different directions. After one round two team members were parcel taped together to keep their vehicle going. The races are fun to watch and the children love running around with the vehicles. Afterwards the remains of the vehicles were unceremoniously thrown into the site skip! Next came the charity auction. It was decided to hold the auction in the Refectory but we didn't have the building exclusively to ourselves this time. It must have seemed quite strange to general members of the public so see us bidding on strange pieces of paper (Bernard's stamps) and other paraphernalia. The money raised from three lots were given to Wadfest to go towards next year's event and the rest was split equally between Wadfest's normal charity Cancer Research UK and the Wood Green Animal Shelter who had looked after us magnificently over the weekend. After the auction, prizes were given out and the event officially came to an end. After saying our farewells we headed back to the car and off towards the motorway. I had a really great time and my girls slept most of the way home. Until December this year you can purchase tickets to Wadfest 2014 for only 20 GBP per adult ticket. The prices goes up in January to 25GBP. Children go free with a paying adult. The 2014 event takes place on the 15th - 17th August (one week after the Discworld Convention in Manchester) and its theme will be Super Heroes and Villains. 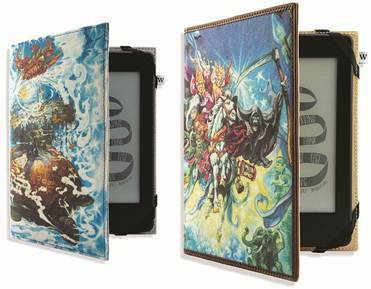 Waterstones is to launch two exclusive Terry Pratchett Kindle cases on 9th September, including a special edition signed case. Both will feature Josh Kirby artwork and will be available from Waterstones bookshops nationwide as well as online at Waterstones.com. The Terry Pratchett Special Edition Discworld cover for Kindle and Kindle Paperwhite will have an RRP of 29.99GBP. It features Josh Kirby's artwork for the original edition of Eric, originally published in 1990, printed digitally onto linen. Fans who register their interest for the limited edition case but are unsuccessful will receive a 10% discount code for the standard case. Kate McHale, Waterstones SF & Fantasy Buyer, said: "Waterstones is filled with fans of Sir Terry so we are thrilled to be able to bring Discworld readers these wonderful Kindle cases featuring such iconic artwork. These will be the perfect Christmas presents for any digitally-minded Terry Pratchett fan." Please note that these cases only fit the later generation kindles. If you have one with a built in keyboard (like me - Ed) you are out of luck as these kindles are too big for the cases. The leaning tower at the junction of Rime Street and Frost Alley. Dr Underschaft was the Chorus Master at the Ankh-Morpork Opera House.